David Frum's new book promises a searing indictment of Donald Trump. What it delivers is an elite-friendly defense of the rotten system that produced him. 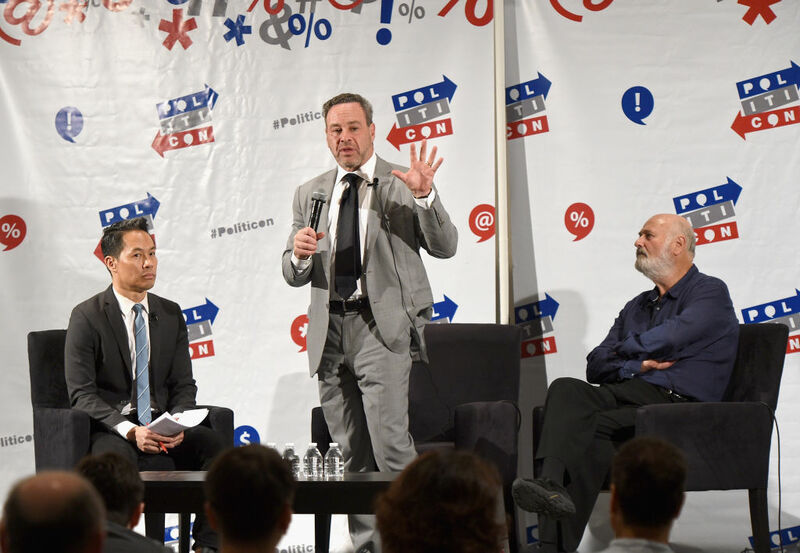 In the arid ecosystem of the professional punditsphere, few have prospered more from Donald Trump’s ascendancy than the now-omnipresent David Frum. Amid the destructive and interminable circus of Trump, the Canadian expat, former Bush speechwriter, and neoconservative polemicist is really and truly everywhere: MSNBC, CNN, CNBC, CBS, ABC, NPR, New York magazine, Vox, the New Yorker, Newsweek. Armed to the teeth with bylines, speaking slots, and editorships from across the gamut of legacy media and cable news, Frum has emerged as the de facto leading voice of the tiny but endlessly eulogized faction generally called #NeverTrump conservatives and a darling of the bipartisan #Resistance. In the world of lushly paid talking heads and respectable political commentary, Frum’s cross-partisan appeal is now probably unmatched, as is his adeptness at flattering the sensibilities of mainstream center-left and center-right alike. Unsurprisingly, then, his new and bestselling book Trumpocracy: The Corruption of the American Republic is similarly ubiquitous and widely praised across the metropolitan cultural bubble: “A masterful diatribe against the Trump presidency,” in the words of one effusive review for Canada’s newspaper of record, the Globe and Mail; “Magnificent,” according to Harvard constitutional scholar (and increasingly deranged conspiracy theorist) Laurence Tribe; “A must-read” (fellow neocon Max Boot); “Measured, insightful, and scrupulously researched” (Robert De Niro); “An essential book” for our time (former Bush, McCain, and Schwarzenegger advisor Steve Schmidt). Trumpocracy is perhaps the definitive text yet published in the increasingly vast and lucrative industry of mainstream anti-Trump literature. Framed as “a study of rulership, not personality,” its author sets out to explain “President Trump’s power: how he gained it, how he has used it, and why it has not yet effectively been checked.” In this way, Frum lays claim to nothing short of a structural account of the Trump presidency and the threats it poses to democracy. Those expecting such an account will be disappointed. More accurately, Trumpocracy is a kind of popular handbook that lays out the mainstream, consensus view of America’s deservedly loathed forty-fifth president. Dealing variously with the conditions and people believed to have enabled, allied with, and appeased Trump; his use of the presidency as a vehicle for personal enrichment, his incompetence and unpredictability, his dishonesty, his foreign policy, his relationship to conservatism and the Republican Party, and his assault on legal and institutional norms, the book reads like a pastiche of the author’s own articles from the Atlantic and summarized reports from the New York Times and the Washington Post. Consequently, anyone familiar with mainstream liberal commentary and reporting on Trump will find little here that’s new. Even sympathetic liberal readers may balk at Frum’s elegies for the American conservative movement and his suggestion that it has ever, in recent history, meaningfully embraced democracy. Some may also catch the author, in his less guarded moments, attacking Trump from the right — as when, midway through the book, he spends several pages complaining about the president’s failure to help implement several particularly toxic planks of the Republican agenda. Frum, like many of the liberals who love him, seemingly believes in and idealizes a conservatism that has never really existed, except perhaps as a gleam in Aaron Sorkin’s eye. The slowdown in economic growth since the year 2000 and the shock of the financial crisis and the Great Recession have embittered politics too; when there seems to be less to go around, people quarrel more ferociously over what remains… Accelerating ethnic and cultural diversity raises the stakes while aggravating mistrust and resentment between Americans. The failures and mistakes of government policy since 2001 — from the 9/11 attacks, through the Iraq War [Iraq, incidentally, appears just once in the book’s index], through the weak recovery from the Great Recession — have swung the pendulum of power more rapidly from side to side, tempting each of the two parties to grasp for more while it can, conscious that the moment of opportunity will not last long. All of these things, in Frum’s view, eventually collided to produce “the pounding drumbeat of discontent,” which he finds concurrently represented by Trump, the Tea Party, Occupy Wall Street, and Black Lives Matter (a contemptible equivalence lazily justified with the addendum: “These movements had many points of disagreement but even more important similarities, including a rising tolerance for violence”). Elsewhere in the book, the author adds the poststructural turn in the academy — which he depicts as the real origin of “fake news” — and the cultural resentment of white American males in the face of pervasive “political correctness” to the list of culprits (“A lot of people in America felt bullied and humiliated. Not all of them were old white men either. Some of them were young white men”). As with any narrative so sweeping, elements of Frum’s story are at least abstractly correct. The disastrous aftermath of 9/11 and the many disasters of the Bush years, coupled with the corrosive effects of the Great Recession, clearly shaped the political landscape ahead of the 2016 presidential election, as did rising racial resentment (otherwise known as “racism”) and a generalized popular distaste towards traditional political elites both left and right. The grotesque subculture now commonly known as the “alt-right” clearly draws on various strands of white male resentment, and a broader section of the population has yet to fully accommodate itself to the strand of cultural liberalism championed by the metropolitan liberals and their preferred political vehicle, the Democratic Party. Nonetheless, as an account of how and why Trump came to be, let alone what can be done to resist him, Trumpocracy fails in almost every respect. For one thing, in even the most doggedly sympathetic reading of this book, the hypocrisy of its author proves impossible to ignore. Whatever the potential merits of the arguments might be, it’s tortuous, to say the least, to read anguished warnings about “fake news” from someone who was in the West Wing during the heyday of Saddam Hussein’s imaginary weapons of mass destruction, fictitious attempts to buy refined uranium from Niger, and completely nonexistent alliance with Al-Qaeda; to hear about the threats posed by presidential incompetence from a former staffer of the same White House that so brazenly let New Orleans drown; to be lectured on the perils of executive belligerence and polarizing rhetoric from the man credited with coining the phrase “Axis of Evil”; or to be subjected to sermons about kleptocracy and calls to decency, honor, and the rule of law from someone whose former political boss spent eight years oozing nationalist machismo to champion torture, extrajudicial detention, and aggressive war and who possibly became president in 2000 because his brother just so happened to be the governor of Florida. For Frum, the Trump presidency is primarily about the “aggrandizement of one domineering man” at the expense of the public interest. One is left to wonder where the author was that fateful evening in May 2003, when the president who employed him mounted a stunt aboard the USS Abraham Lincoln worthy of a gilded military despot stumbling under the weight of his own medals. Though not in themselves the biggest problem with Trumpocracy, these glaring contradictions hint at why the book is a failure, both as a substantive explanation of the Trump phenomenon and as a political challenge to Trumpism itself. Ultimately, Frum’s anguished account is one you will only endorse or find engaging if you believe, as he so clearly does, that the fundamentals of American society were basically sound prior to November 2016. Sure, in his telling, there was partisanship and lack of compromise between Republican and Democrats. Sure, sometimes people broke the law or transgressed against the rules and norms of liberal governance. Sure, Trump merely took advantage of preexisting conditions latent in American institutions and culture. And sure, Republicans worked hard to deprive marginalized communities of the franchise (perhaps surprisingly, several pages end up being devoted to this phenomenon, though any ensuing moral outrage the author’s part seems muted to nonexistent). But, for Frum, Trumpism is still ultimately a point of rupture rather than one of continuity — a corruption of a fundamentally decent consensus, not an outgrowth of a depraved, immoral, and dysfunctional one. The way that liberty must be defended is not with amateur firearms, but with an unwearying insistence upon the honesty, integrity, and professionalism of American institutions and those who lead them [emphasis mine]. We are living through the most dangerous challenge to the free government of the United States that anyone alive has encountered. What happens next is up to you and me. Don’t be afraid. In other words: having sought to establish that the rot of America’s political institutions and values laid the groundwork for Trump, Frum’s ultimate suggestion is more or less to fall back on some idealized version of them. At the heart of Trumpocracy is a fundamental dissonance between what the author sees as an existential threat to democracy and the scope of his recommendations for resisting it. Despite spending over two hundred pages representing Trump — perhaps quite correctly — as a historically dangerous figure, Frum is only able to offer as an alternative a vague and ethereal nationalism that permits no real dissent against the collective realities of American life, let alone meaningful efforts to change them. In fact, for all his august appeals to unity in the face of a common threat, he seems hostile to the very idea of collective action and is unable or unwilling to parse any differences between the various strands of discontent he identifies or weigh the legitimacy of their demands accordingly. And thus, Black Lives Matter, a popular movement born into existence because of visible and rampant police violence against black people, becomes morally equivalent to a racist demagogue like Donald Trump. Police violence, incidentally, is mentioned just once, and only in the context of the author condemning Trump for encouraging its use against members of gangs. Economic inequality — according to virtually every poll available in 2016 a major issue across the political spectrum — also receives just a single mention, and only because Frum recognizes that popular concern surrounding it could be an obstacle to the larger Republican goal of cutting the top marginal tax rate. Despite dedicating an entire chapter to America’s “Rigged System” and several lengthy passages to Trump’s personal conflicts of interest, the glaringly present influence of corporate money in the political and legislative process goes completely unmentioned in the book. And while Frum himself identifies unemployment, sluggish economic growth, and the Great Recession as conditions that fertilized the political terrain for Trumpism, he does not see fit to offer a single meaningful recommendation aimed at addressing or reversing the damage they’ve caused. Sanders promised a politics of ever-accelerating change, of boundless goals, a politics that offered answers to the existential questions. In a constitutional democracy, these questions should fall to each of us to resolve individually, outside of politics, not collectively and by means of politics. People who have never suffered the tyranny and terror of utopian politics may hearken to radical and revolutionary slogans. We see them in black masks, professing to be “antifascist” even as they emulate the street violence of Blackshirts and Brownshirts against the targets of their own totalitarian ideology. The Trump presidency may administer a much-needed booster shot to enhance the anti-authoritarian immunities of a younger generation apparently lacking in them. Here we find the author cleaving to the horseshoe theory of politics which now more or less forms the deep structure epistemology of the political center, by which any serious challenge to the status quo is by definition equivalent regardless of its actual analysis or its demands. But we also, more significantly, find his inveterate conservatism shining through. Indeed, Frum’s tone throughout the final chapter (“Hope”) may strike a superficially optimistic cadence, but Trumpocracy shows him to be a committed pessimist when it comes to the capacity of democratic politics to bring about meaningful change. Even in the face of a hopeful, youth-driven electoral movement like the Bernie Sanders campaign, Frum’s parochial worldview can only discern a prospective imposition on individual life rather than a necessary and laudable expression of it. Relatively modest objectives like eliminating tuition fees at public colleges or creating a health care system that doesn’t kill tens of thousands of people a year are taken to be “existential questions” outside the realm of politics or democratic action altogether. For all his angry bluster and withering institutional critique, the author reveals himself to be no less than a militant partisan for the very status quo that gave birth to the presidency he despises. With meaningful collective action as a tool of resistance to Trump off the table, all that’s left is a reaffirmation of basic liberal norms and a series of mostly rhetorical demands for decency and transparency in government. I’ll leave it to others to offer up ideas here, but if the critique found in Trumpocracy is any indication, “broadly satisfied with the status quo” deserves to be emblazoned prominently on the book’s front cover next to the author’s own byline.